The "Evacuator" is made from a unique natural bark. 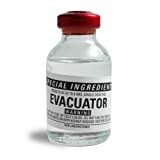 When mixed with food or liquid, it will cause total uncontrollable "evacuation". Via the natural route. These "special ingredients" are just what you may need in some "special situations". Manufactured under contract by DSG Laboratories to fulfill the occasional unusual operational requirement of CIA and other federal agents, these products are now available for non-governmental sale. Use only with utmost discretion. The "Evacuator" is made from a unique natural bark. When mixed with food or liquid, it will cause total uncontrollable "evacuation." Via the natural route. Stand CLEAR! Warning: not to be used on others without their consent.